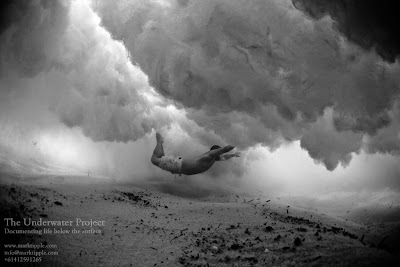 Mark Tipple: The Underwater Project. 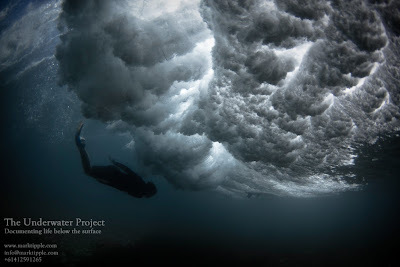 Documenting life below the surface. 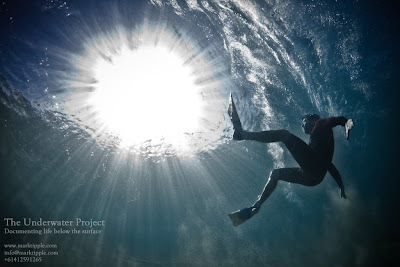 "I've always been fascinated with what happens below the surface, like what's happening where we can't see." While watching the slideshow on Mark's laptop I'm amazed at the detail of this 'other world' that's portrayed with his selection. 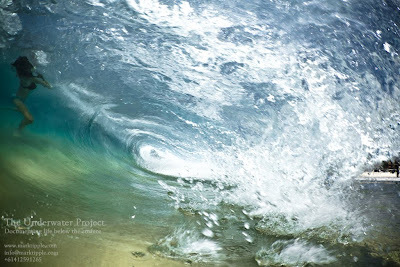 As an accomplished documentary photographer, in the past Mark has used the ocean as an escape for some solace away from the projects he's been documenting. 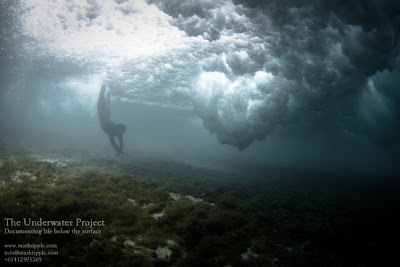 Lately, while in-between projects he's been "hanging out" below the surface trying to capture what happens while swimming on a slow summer's day. 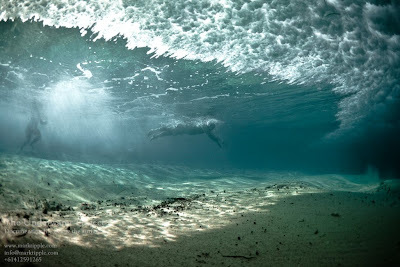 "Coming from a surfing background I used to wonder what happens when we're duckdiving, like, what it looks like from a different angle than what we can see. Kinda hard to explain but it has always been on my mind. I used to surf with a small video camera and housing attached to my helmet, (pauses) it worked surprisingly well but my neck couldn't take the impact and stress when a surfer is caught amongst the whitewater being thrashed about while I'm trying to duck-dive myself trying to capture the right angle. Even tried to turn it back on myself to see what happens clearly but that, uh, sucked (laughs). 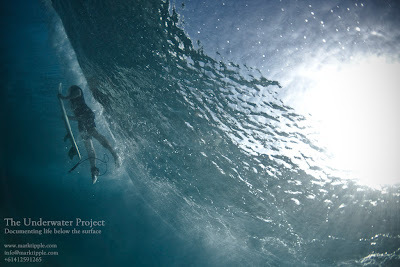 I looked for a new approach to capture what I was seeking, which basically meant getting off the surfboard." 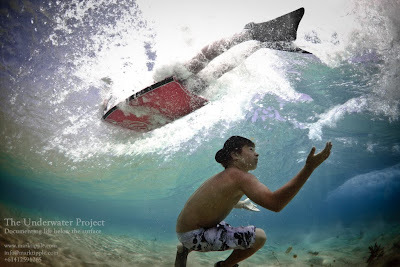 Surfing is a notoriously frustrating sport, where a number of elements have to be present for a good surf session. 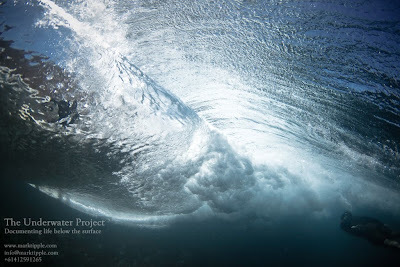 From the correct wind strength and direction, to the correct tide for the reef or sandbar, to the correct swell direction for the location, which all depends on there being swell present on the day it's enough to turn away the most dedicated surfer to take up tennis or cricket, something less elemental dependent. "So many times back home we've be driving through the bush for 2 hours on a one way track only to find that the surrounding sand has covered the reef from an overnight tidal movement making it break wide or just weird...even if the 3 main elements are there (wind, swell, tide) there's always a chance for something unexpected to ruin the trip." As the Australian summer hits and Mark is city bound for the next few months with film commitments, he has been finding the angles he's always been looking for, even through the lack of quality waves. "Last week down the road from my house there was a pretty big swell...well, for Coogee anyway, and at the start of the school holidays there were kids everywhere being smashed in the closeout shore-break. 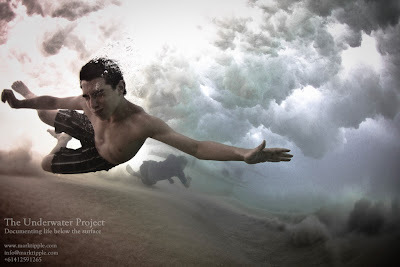 I was only in the water for about 30 minutes when I was walking backwards as a wave rolled past to shoot the swimmers diving underwater when my legs were taken out beneath me by someone diving under the wave, sending me over the falls backwards." 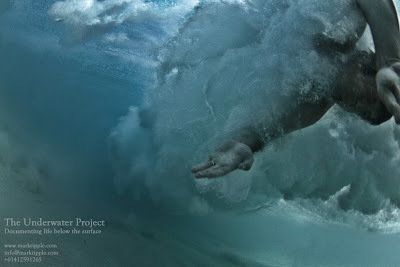 Mark goes on to describe how he was pinned underwater by his weight belt, which was "no problem but the impact of the wave ripped the housing out of my hand and snapped the leash leaving my housing and camera tumbling somewhere amongst the whitewater and swimmers. 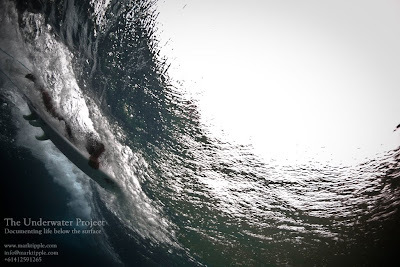 I managed to find it two waves later after a pretty frantic search, so stoked it didn't leak." He's just returned from a week away in the South Australian desert, going to some remote places with a good friend who was willing to help capture the different angles for the images he's been looking for, but hasn't had anyone to link up with. 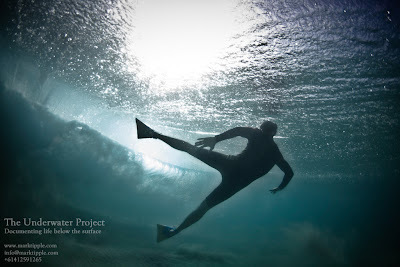 "Working with Mike pretty much achieved what I had been looking for around the beaches in Sydney, to add another element to the frame other than just surfers in the form of a swimmer when both the camera and swimmer are behind the wave added the extra point of interest for the eye." Mark agrees that it's quickly turned from "something fun when there's no waves" into a product that's gaining recognition and respect from various sources, if the last few months are anything to go by we're sure to be seeing a lot more in the near future. 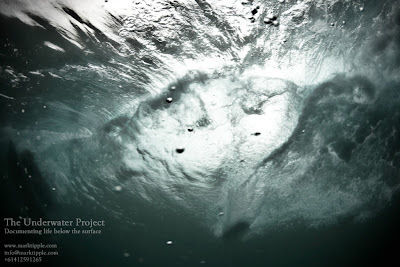 experience to create an impacting multimedia project. Very fascinating! Must take a lot of experience to see things like this and do the pics.